Display this scary zombie body parts groundbreaker prop indoor or outdoor your haunted house and watch unsuspecting victims run for their lives! He is crawling back out from his resting place to scare guests and trick or treaters. Creepy realistic-look larger than life size zombie body parts: severed head and hands. 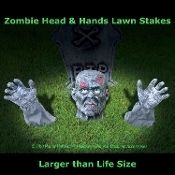 Perfect in front of a tombstone in your graveyard, this zombie ground breaker consists of plastic larger than life size head and hands that stake into the ground. A quick cheap and frighteningly easy way to add a ghoulish touch to any spooky haunted house scene. -One (1) zombie head and Two (2) hands with cloth fabric sleeve arms. -Ground stakes to add to your own spooky indoor or outdoor cemetery graveyard scene. Hands and head made of durable hard hollow plastic. Sleeves are fabric cloth material.